With most Islamic geometric patterns there are numerous ways to construct the one ideally proportioned solution. 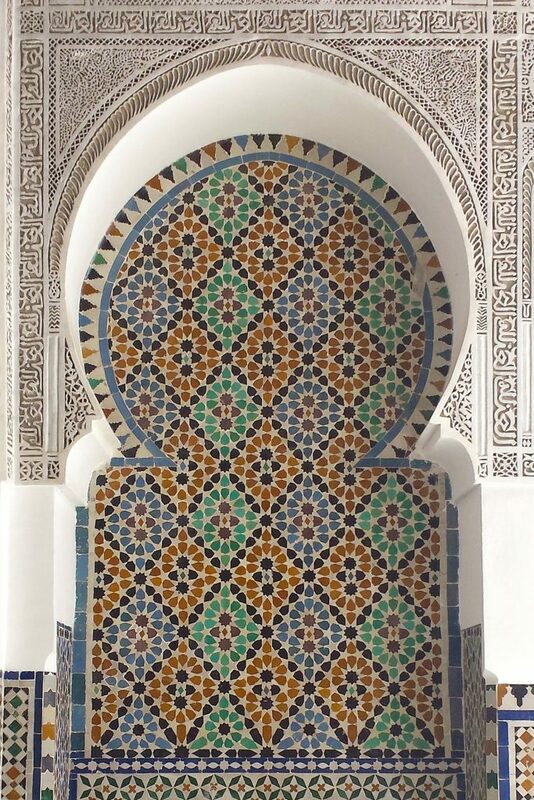 I came up with a method to draw this tenfold pattern from the Moulay Idriss Mausoleum in Fez featuring a beautiful overlapping rosette over a year ago, but have only just got round to filming myself drawing it. Revisiting this approach, I find it an enjoyable method which highlights the two golden rhombs (also known as Penrose rhombs) underpinning the design’s structure. The underlying grid also defines all the proportions required to construct the pattern correctly, making it relatively straightforward to draw with ruler and compass. Dotted lines shown in the step-by-step guide at the bottom of the post do not need to be drawn in their entirety but will highlight required intersections. I have chosen to construct the pattern in a different orientation to the historical example because I prefer the balance in the design when the overlapping rosettes appear horizontally, perhaps because they match the orientation of your eyes. I also think the design conveys something of the duality inherent within unity. I hope that you enjoy drawing it and staring at it as much as I do. Thanks Susan.. look forward to seeing what you make from it! This is lovely to see. Can’t wait to play with it! Glad you figured it out Dawn. I kept the timelapse fast because it was meant as an overview of the drawing process and because the steps were outlined in the diagrams. Look forward to seeing your result!